Custom and Stock Retail Displays For More Than 30 Years. with our knowledge, commitment, and design innovation. 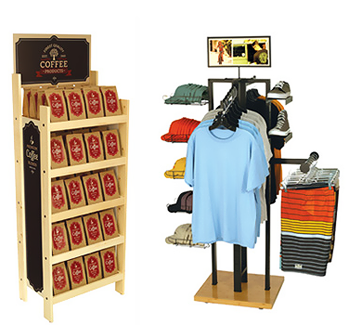 Improve your retail brand with our Custom and Stock POP Displays. We invite you to explore our online store where you will find highly practical and affordable POP displays to merchandise a wide range of products in almost any type of retail environment. Many of our stock retail displays are available to be purchased online, while others can be seen by clicking on the Stock Displays tab. If you find a display that is not available to be purchased online, just contact our customer service department at 800-325-5538 or email us at sales@richltd.com, and we can help you. Also, be sure to check out our custom POP display portfolio. Just let us know if you would like to discuss a custom POP display, and we will make one of our team members available. RICH LTD. is your one-stop provider for high value, high return custom and stock retail POP displays and merchandising solutions. Our focus is World Class Retail Display design based on client expertise, translating client knowledge into programs that deliver high ROI in the retail environment.It’s easy to design attractive, consumer-centric displays. It takes real design experience to translate a design idea into a highly differentiated and efficiently manufactured fixture. Our in-house design team consists of European, American, and Asian influenced design styles. Our 3D Modeling, CAD and SolidWorks capabilities provide us with the tools to maximize the merchandising effectiveness of every display, while ensuring we meet our customer’s budget, timing and quality objectives. RICH LTD. has multiple locations worldwide with manufacturing capabilities in China, Vietnam, the U.S., and Mexico. This global blended manufacturing model helps us manage product development, production, and global logistics efficiently. After 30 years in the business and more than 3500 projects, The RICH LTD. team has the experience needed to help our clients stay relevant and fresh in the retail marketplace through the use of time-tested display construction methods and integration of the latest technologies that consumers understand. 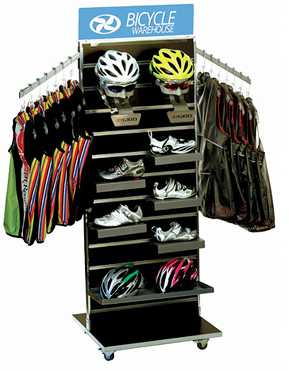 To help you put together an effective POP display program using our stock displays. RICH LTD. created a unique customer experience for Coffee Bean & Tea Leaf, highlighting the best of both design and brand. A unique combination of art and engineering, the Romo counter display features a folded acrylic frame, a blow molded acrylic dome, an airbrushed latex moonscape, and integrated electronics with LED lighting. VF Corp uses one of our best stock HRack displays combined with slick customization in the form of header signs. Using a existing display design is one of several ways to drastically reduce display lead time. For over 30 years, RICH LTD. has been designing and manufacturing custom point of purchase displays and retail store fixtures. We work across a broad range of industries and make POP displays for some of the world’s leading retailers and brands. We design permanent as well as temporary custom retail displays for almost any budget, including a wide range of floor displays and counter displays. In addition to our custom merchandising solutions, we offer a full line of unique, innovative, and design-oriented stock point-of-purchase displays- including slatwall displays, pegboard displays, floor shelf displays, sunglass racks, cap displays, end caps, bamboo displays, 4-Way displays, nesting tables, counter and floor hook displays, table top displays, multi-product merchandisers, and more. 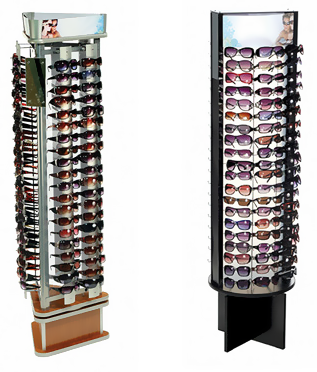 As part of our stock display program, we offer a full line of sunglass displays and eyewear fixtures. These range from our higher end signature LINK Series of floor displays and tabletop eyewear displays to numerous wire and plastic sunglass displays that comprise our line of economy sunglass displays. With respect to capacity, our sunglass racks hold as few as 6 pairs of sunglasses on the low end to as many as 144 glasses on the high end. We offer many other options that hold 12, 36, 54, 72, 96, and 120 glasses. Most of our sunglass displays offer a compact footprint and are designed to spin which makes them suitable for a wide range of retail environments. Most of them also feature a knock-down design with easy assembly which makes them economical for shipping and storage. Our slatwall displays are among our most popular fixtures in our line of stock displays. We offer a 2-sided mobile slatwall display which features knock-down construction, aluminum slat inserts, MDF panels with a variety of color choices, and castors. We also offer a number of accessories for our slatwall units, including hooks, an acrylic sign holder, shelves, an apparel hanging bar, flag signs, and waterfall arms. In addition we offer a highly versatile “H” slatwall rack that provides a higher capacity solution than our 2-sided unit. Follow Rich LTD on Instagram!